I am long overdue in sharing some updates for how last year’s New Diyears resolution to-do list went. Despite my delay in updates on what went down last year, I surprisingly got a lot of my to-do list done. One of my checked off items is sewing new family room pillows. I wanted to bring in the color green as an accent in my family room so I started by sewing new pillows. I found a fun green pattern print at Joann Fabrics and bought a couple of yards, using a 40% off coupon of course, and got to work. This was my first time sewing pillows from scratch since probably middle school, but I’m happy at how the results turned out. I wanted to make sure these pillows would be durable so I sewed an insert pillow out of cheap white fabric first and then used the green fabric to make the pillow covers. I sewed an envelope style back so the pillow inserts could be slipped out and the covers could be washed if needed. I made sure to wash and dry the green fabric before sewing to ensure the fabric didn’t shrink during future washes. They do make a good make for a good napping spot. The pillows go well with the argyle sweater pillow I sewed last winter too. And they match perfectly with the quatrefoil tray I painted for the family room too. I think with these pillows, and the vintage tea towel pillow and placement pillows I made last year, I can safely cross off “sew new pillows” from my to-do list! My aunt recently gave me this cute Ukrainian folk art. The wood dolls depict a couple getting married and they are dressed in ribbons as their folksy traditional garbs. I hung it on my small kitchen wall next to our pantry (where I previously hung our small mail sorter before upgrading to a bigger mail organization system). I like the colorful sweet dolls and think they add some cheer to the kitchen. And since my family has a Ukranian/Russian background, it makes it even more special to me. Do you collect any folksy art or show off your heritage in your home? Hahaha! What do you think? Feel free to share this around if you like my interpretation! How was everyone’s Valentine’s Day? I got home from work yesterday and wanted to cook up something special for my Hubby, so I decided to make his favorite food: PIZZA! Are we romantic or what? Rob usually bakes up a homemade pie a few times a week (like I said, he loves pizza), so I wanted to give him a break and make a special Valentine’s Day pizza- heart shaped! The quickest way to a man’s heart is through his stomach, right? So what’s faster than heart shaped food! We use store bought whole wheat pizza dough. I sprayed our pizza stone with non-stick cooking spray, rolled it out the dough like usual on it, but then cut a “V” at the top and shaped the bottom into a point. I figured the pizza would lose some of its shape while baking, so I wanted to make the heart shape extra pronounced while the dough was raw. Then I loaded it up with sauce, mozzarella cheese, and with a cherry tomato heart border (and mushrooms too, although they’re not in the photo below). I popped it into the oven at 450 degrees and waited for my heart shaped surprise. The pizza looked great once it was done! Rob thought the heart shaped pizza looked great, but he was most excited about eating it! And I must say it was delicious! Did you have a Valentine’s Day dinner last night? Was it ultra-romantic like ours or did you just have a fancy meal by candle light? Haha! Happy Valentine’s Day, friends! Hope you get a chance to celebrate something or someone sweet in your life today. We don’t do too much for Valentine’s Day, but my sweet hubby did get me the roses pictured above. In fact, he is twice as nice, because he surprised me over the weekend with one bouquet of Valentine’s day roses and a second bouquet of congrats-on-your-new-job roses. Yep, I just started a new job that I’m pretty excited about. But I didn’t take any time off between my old and new jobs, hence I’ve been pretty stressed and exhausted the past 2 weeks. So in case you were wondering why you haven’t seen me blogging much, that’s why. Hopefully I will grow accustomed to my new job, schedule, and commute and will be back in full swing soon! But enough about that, how do you celebrate Valentine’s Day? I might not have done much, but I did come across some great projects online. (You can also follow me on Pinterest to see some of the other stuff I came across). 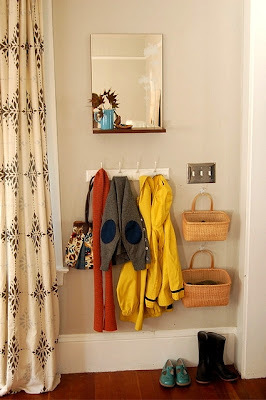 Cute baskets used to organize an entryway. 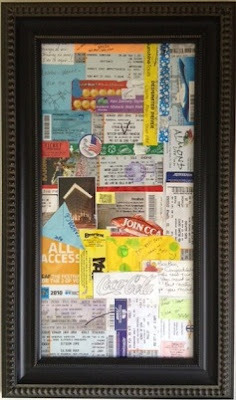 Great idea to display ticket stubs and other memories. 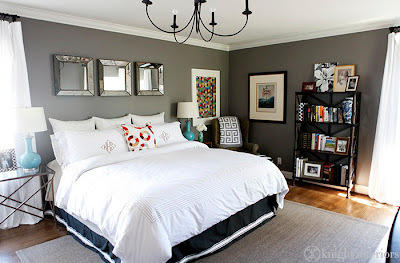 Beautiful grey guest room makeover. Gorgeous turquoise family room. I love everything about this room. I hope you were more productive than I was in January. Did you start the year with any projects?